Serena Williams is pregnant with her first child, her spokesperson has confirmed. 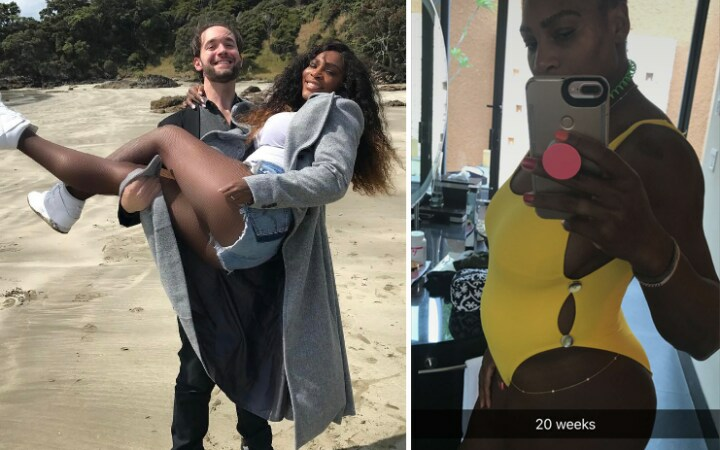 The tennis star hinted at the good news when she posted a photo of herself on Snapchat wearing a swimsuit and revealing what appeared to be a large baby bump with the caption “20 weeks” on Wednesday. The snap was deleted less than a half hour later. However, Williams’ team confirmed the implications of the photo later in the day. “I’m happy to confirm Serena is expecting a baby this fall,” a spokesperson for Williams told the Guardian by email. The Women’s Tennis Association, which listed Williams as scheduled to enter next month’s Madrid Open as recently as Monday, said they had yet to be contacted by anyone from the American’s team regarding her status. Williams, 35, announced she was engaged to Reddit co-founder Alexis Ohanian in December. The announcement left the sport’s chattering class wondering to what degree she was looking ahead to life after tennis. She answered that speculation with brio at the Australian Open, capturing her 23rd major singles title without dropping a set, to eclipse Steffi Graf’s record for grand slam titles in the Open era and regain the No1 ranking she had ceded in the fall to Germany’s Angelique Kerber. But she has been inactive since her win over elder sister Venus in the final at Melbourne Park. Last month, Williams pulled out of Indian Wells and Miami, citing a left knee injury. That enabled Kerber to retake the top ranking, though Serena is assured a return to No1 in next week’s table when the points from last year’s Porsche Grand Prix drop off. The announcement comes one week after Victoria Azarenka, the former world No1 and two-time grand slam champion, announced she will return to the tour after 14-month layoff that included the birth of her son, Leo, in December. Williams’ win at Melbourne Park made her the oldest player to win a major singles championship in the Open era, breaking a record she set herself last year – and again the year before that. She has won grand slam titles in her teens (one), 20s (12) and 30s (10, more than triple the previous mark). No one could think less of Williams, now closer to 40 than 30, if she called it a career. But there’s equal if not more reason to believe Williams has unfinished business. She remains tantalizingly close to the all-time grand slam record held by Australia’s Margaret Court, whose 24 major titles were split between the amateur and professional eras. She still plays at an extraordinary high level, having won 125 of her 138 singles matches since Wimbledon 2014. And while there are no shortage of young lions on the tour, among them Garbiñe Muguruza, Karolína Plíšková and Madison Keys, none has offered a sustained challenge of Williams’ dominance the way Monica Seles swiftly ended Graf’s stranglehold on the sport. Nor would Williams be the first mother to excel on the tour. Kim Clijsters was already a borderline Hall of Famer when she retired abruptly at 23, having won the 2005 US Open and spent 19 weeks atop the women’s rankings. But the Belgian was even better after a 28-month layoff that included the birth of her daughter, winning once more at Flushing Meadows as an unseeded wild card in only her third tournament back. That made her the first mother to win a major singles title since Evonne Goolagong Cawley at Wimbledon in 1980, setting the stage for a final act that included two more grand slam titles and a return to the No1 ranking.